Responsibility list. which have 2 lookup columns; one referencing the Main Category while the other referecning he Sub Category list. but this will not have any effect. where inside the New form, all the main and sub categories will be shown. 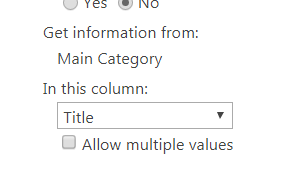 So can anyone advice how to get my Cascade drop-down lists working? You need to use _x0020_ to replace space in your code. Not the answer you're looking for? Browse other questions tagged sharepoint-online development jquery spservices spcascadedropdowns or ask your own question.